In Bizen, “good old tradition” is being preserved and BizenPottery is being made through climbing kilns unchanged through history and split pine wood. The clay that comes from the earth itself is fired for a long period whereby pottery is made. Such simple pottery that is created from the natural interaction between earth and fire and their fusion, including the warmth that is felt from it, constitutes Bizen Pottery. The earthy characteristics that are born from the firing, the beauty of its form, and the simple elegance of uncontrived production serve as the origins for Japanese aesthetics. 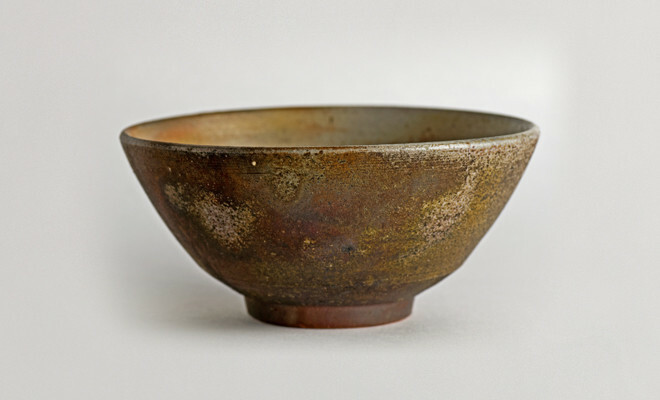 Transcending the flow of the times and trends, Bizen pottery has come to be loved by many Japanese. Derived from its simplicity, the rustic feature of Bizen pottery suits the disposition of the Japanese who love nature and pay reverence to innumerable deities and takes a firm hold of their hearts. At the Six Ancient Kilns that have served as production sites for ceramics since the medieval period, the fired effects of their pottery started without glaze (the glassy film which covers the surface of chinaware) and it is only in Bizen that firing without glaze has continued to this day. The secret for Bizen pottery being fired without glaze to this day lies in the earth. The earth of Bizen is high in iron content, pliable and easy to use. However, although the earth can resist high temperature firing, it is also sensitive to dramatic fluctuations in temperature. Therefore, it has to be fired slowly over a long period of time. Over this time, the shrinking rate of the clay increases and as a result, it doesn’t match the way the glaze melts. Even if we assume that we can control the way the glaze melts, because there is a high iron content in Bizen clays, blackish spots emerge when glaze is applied which means that it does not finish as beautifully. The use of glaze has been tried before in the past. However, due to the special quality of its clay, Bizen has continuously been associated solely for its history of unglazed pottery to this day.